e-Learning As A Business: Why e-Learning can help you leverage all your personal and business resources! Today it is easy to make a success (and develop a business) by capitalizing your knowledge and skills and helping people reach their true potential! The turn of the new century has found some established forms of working while speared out the establishment of some new business practices and models providing new solutions and approaches in the form of consulting or services. One of these business models is e-Learning. e-Learning today is big business. It is estimated that “e-learning market in 2023 will surpass $240Billion” while the corporate area “is expected to reach $31Billion in 2020” (both references from E-learning in 2017. Facts and trends). In the 21st century, the most desirable assets are the skills and the knowledge/digital components, while the most cherished commodity is … the time! Our society is in constant demand for more skills, knowledge, and competencies in the shortest time possible! And new forms of distance learning start to emerge while other forms still hold a large percentage of the market. E-Learning is a solution (and a coherent approach) to the problem of lifelong learning, while the demand for more training and education is still rising along to the ever increasing working demands required by today’s employers! Today business tries to comply constantly with the changes in the economic, market and financial environment and compensates accordingly. One way to do that, especially for large business, in an effective and cost productive manner, is the e-Learning. e-Learning is one of my favorite topics and one field I am active the last 20+ years in! I have led, coordinate, designed and involved in many e-learning, course development, instructional design, research and development and training project in various roles and capacities. This small book covers many of my observations in the field and some ideas I want to share with the world. I hope it would be as useful as it was for me! e-Learning, today, is a major asset for the skill development of everyone. It is essential now that every person should have unlimited access to learning resources according to his/hers style because the right to the knowledge and to the personal development is a critical factor of success in modern society and business. This is one of the main drivers for the development of e-Learning as a discipline as well as the advancement and personification of the existing technologies and tools. This is one of the main drivers for the development of e-Learning as a discipline as well as the advancement and personification of the existing technologies and tools. More specifically this e-Learning As A Business focuses on the intersection of e-Learning, entrepreneurship, startup business and knowledge transfer not from a theoretical point of view but from a practical view. 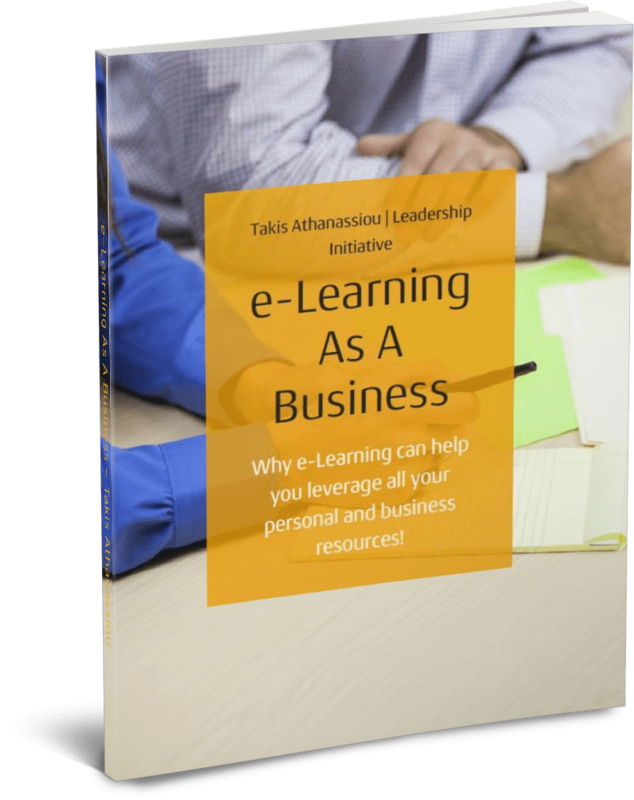 You can get your free copy of the “e-Learning As A Business: Why e-Learning can help you leverage all your personal and business resources!” by fill in your name and your e-mail to the form below!